The Düsseldorf school of painting refers to a group of painters who taught or studied at the Düsseldorf Academy (now the Staatliche Kunstakademie Düsseldorf or Düsseldorf State Art Academy) in the 1830s and 1840s, when the Academy was directed by the painter Wilhelm von Schadow. The work of the Düsseldorf School is characterized by finely detailed yet fanciful landscapes, often with religious or allegorical stories set in the landscapes. Leading members of the Düsseldorf School advocated "plein air painting", and tended to use a palette with relatively subdued and even colors. The Düsseldorf School grew out of and was a part of the German Romantic movement. Prominent members of the Düsselorf School included von Schadow, Karl Friedrich Lessing, Johann Wilhelm Schirmer, Andreas Achenbach, Hans Fredrik Gude, Oswald Achenbach, and Adolf Schrödter. 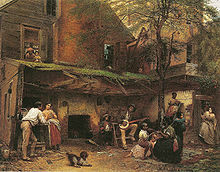 The Düsseldorf School had a significant influence on the Hudson River School in the United States, and many prominent Americans trained at the Düsseldorf Academy and show the influence of the Düsseldorf School, including George Caleb Bingham, David Edward Cronin, Eastman Johnson, Worthington Whittredge, Richard Caton Woodville, William Stanley Haseltine, James McDougal Hart, Helen Searle, and William Morris Hunt, as well as German émigré Emanuel Leutze. Albert Bierstadt applied but was not accepted. His American friend Worthington Whittredge became his teacher while attending Düsseldorf. Clearing Up—Coast of Sicily, Andreas Achenbach, (1847). The Walters Art Museum. The Veterans (From Days Gone By) by Bengt Nordenberg. Oil on canvas, 1882, Hallwyl Museum. ^ Humboldt, Wilhelm von (1968). Albert Leitzmann (ed.). Gesammelte Schriften. 1. Abteilung: Werke. Band 6 1827-1835. Walter de Gruyter. p. 585. ISBN 978-3-11-019258-2. Retrieved 4 January 2011.